Close to restaurants,shops and 10 min walk to the nearest beach. 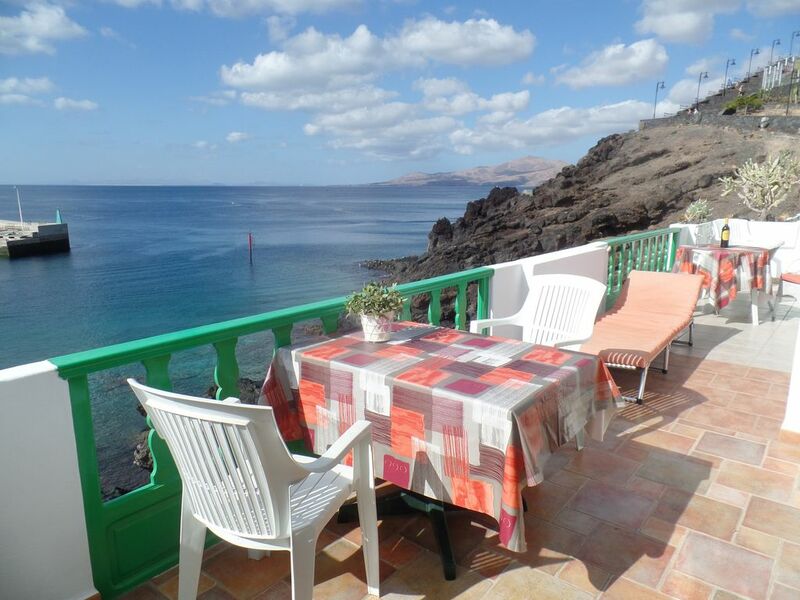 The apartment is situated on the rocks in the harbour of the Old town of Puerto del Carmen. You can follow the fishing boats, the ferries and other daily life on the sea from the terrasse. There is also a gate from the apartment leading directly down to the rocks by the sea. The sun is shining from early morning to late evening. We have awnings to cover the terrasse when the sun gets to hard. The terrasse is large, 25 M2 in all. You can sunbath in peace and quiet, or just relax and listen to the birds and other everyday sounds. There is no traffic glam close by. The location is very peaceful. The nearest grocery is less than 5 min away. You can get your fresh bread for having breakfast on the terrasse very easy. There is also several restaurants less than 5 min away. It will take you about 5-6 min to walk into the very heart of the Old Town. The nearest beach is 10 min walk. There is free Wifi in the apartment and also a safe. I am from Norway. My husband and I are past the 60th and newly retired. We love Lanzarote and have visited the Island for more than 30 years. We bought this apartment because of its location. We just love to sit here and enjoy the sea, the sun and the sky. We are very close to all the elements. It is quiet here, but still a lot of life to watch in the harbour. It is also very important to us to see the mountains. When the sun sets we can watch the most beautiful scenery. We are very happy about the short walking distance to everything. We have everything we need and more right outside our doorstep. The bath room has a walk in shower. There is also a washing machine. There is an electrician owen for use when needed. There is two living room. One close to the terrasse with two decliners and dining/breakfast table. The second with TV inside in the other end of the apartment. There is an open kitchen. When you arrive the apartment you will be met by John, the English man who takes care of the apartment. He will give you the keys and show you around a bit. He will be your contact while your live in the apartment. Thank you so much for nice words. I really presiate to hear. Thank you so much for writing this rewiev. It is so nice to hear that you find the apartment that good. I agree with you, the airea is peaceful and safe. But still filled with all shops, bars and restaurantes. I look very much forward to having you as our guests next year. It is so nice with returning guests. You are very welcome back. Amazing views from apartment balcony made holiday very special. Good walk into Puerto Carlo capturing more views. Great food, mostly chosen from trip adviser. Thank you very much. I am happy you enjoyed it all. We are here by now, it is so nice to be here. Even though my husband and I had to come home 3 days early due to a family bereavement. Or 1st week was just great so relaxing sitting watching the boat go by in the lovley sunshine. The apartment was fabulous had every thing you need. We would definitely return. Thanks to John the lovley caretaker for bring us a fan for the really warm nights and also for arranging our taxi to the airport. I am happy about that you enjoyed the place as much that you want to come back to stay. You are very welcome. Just dont wait to long to book, the apartment gets booked up fast. We feel very lucky about having John as our caretaker of the apartment. He always helps out if something.